Much has changed since Friday December 17th, 1897 when Sydney Golf Club members Messrs Leonard Dobbin, E.D. Hoben, Irving Kent and an unnamed colleague cycled from Sydney with the materials required to construct holes, flags and teeing grounds at Wollongong. With the assistance of the founding committee, a nine hole links course was completed and the following afternoon (Saturday December 18th, 1897) an exhibition round was played marking the arrival of golf in Wollongong. Today, a true links style 18 hole course stands alongside the beach, largely on the same site. The club has hosted many tournaments over the years, most recently the NSW P.G.A. Championships (2009 – 2011) and the Jack Newton Subaru State Age Championships (2014 – 2015). Although Wollongong Golf Club is one of the oldest in Australia, and fast approaching a 120 year milestone, the core values and philosophy have remained the same with mateship, enrichment and respect being at the heart of everything we do. 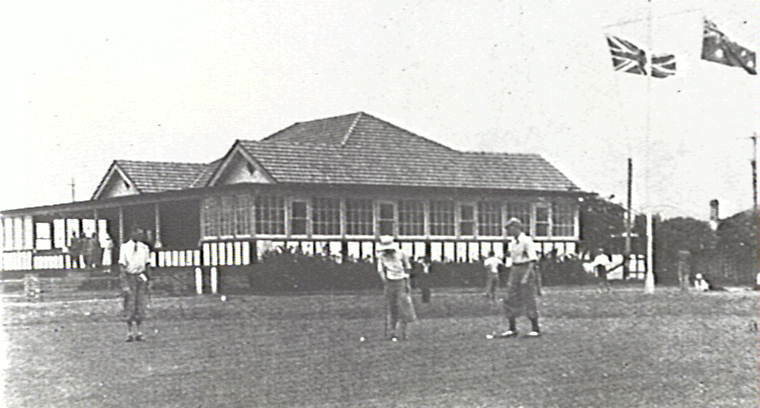 Early Wollongong Golf Club clubhouse. The honour boards on the walls of the modern clubhouse are full of State and National champions. Many world famous stars including Carnegie Clark, Gene Sarazen, Jack Newton, Bobby Locke, Gary Player and Peter Thompson have played a round at the course. Steve Elkington was a member of Wollongong in 1980-81 and Brad McIntosh (current holder of Australian PGA Tour professionals’ record low score of 59) won his first of 4 Wollongong 72 holes Championships as a 13 years old. Wollongong golfers who gained State and/or Australian honours are far too numerous to be noted here. However, exceptional among them are Keith Pepper, Rory Slade and Lynne Townsend. Keith aged 90 has won over 50 Open events and Rory has a similar total including a record 15 Club single and over 20 other Club titles. Apart from victories elsewhere Lynne is listed more than 40 times on Club Championship boards.